Stranger Things TV series renewed for a second season on Netflix. 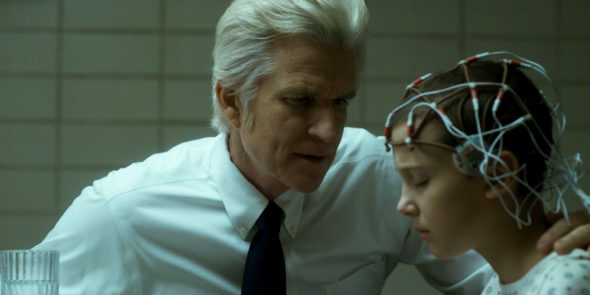 Pictured: Matthew Modine, Millie Bobby Brown (Photo courtesy of Netflix). The adventure continues. Netflix has renewed the Stranger Things TV show for a second season, planned for 2017. Watch the season two renewal announcement, below. The story will resume in the fall of 1984. The Stranger Things TV series cast includes: Winona Ryder, David Harbour, Finn Wolfhard, Millie Bobby Brown, Gaten Matarazzo, Caleb McLaughlin, Noah Schnapp, Natalia Dyer, Cara Buono, Charlie Heaton, and Matthew Modine. Co-showrunners and EPs Matt Duffer and Ross Duffer write and direct. Director Shawn Levy and Dan Cohen executive produce via their 21 Laps entertainment banner. Watch the Stranger Things season two renewal announcement, from Netflix. What do you think? Have you watched the first season of Stranger Things, yet? Do you plan to watch Stranger Things season two on Netflix?